Credit: Joe Shlabotnik on Facebook. Some rights reserved. 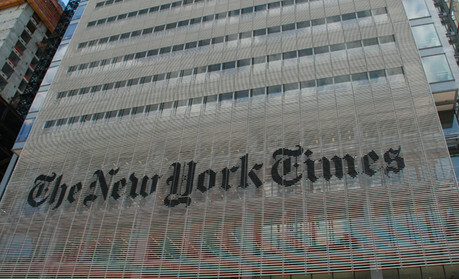 The number of unqiue users recorded last month by the New York Times website in the US increased by 2.3 per cent year-on-year, despite the introduction of digital subscriptions in March this year. Speaking on a paywalls panel at the World Editors Forum in Vienna, Jim Roberts, assistant managing editor for digital, said the year-on-year increase to an average 34 million unique users in September per month was "incredibly surprising", admitting that at first he thought the paywall was "at least potentially a bad idea". "I argued against it. It was a position that wasn't extremely popular throughout our newsroom but I really worried a lot that our audience which we had worked so aggressively to build would shrink a lot. "I really worried that we'd lose a lot of our younger readers who we had really aggressively courted with a bunch of innovative ideas, social media use etc. I worried deeply they would flee, worried there would be an impact on our advertisers, if our readership shrank. "Well I'm here to tell you I was wrong. The good news for the New York Times is that while it is still very early in our experiment, it has been largely good, I even think I can say it has been successful." In relation to traffic in particular he said worries within the newsroom "were greatly exaggerated". "We have experienced a drop in page view numbers oversees but very little decline domestically. And what was incredibly surprising to me was that our uniques have actually grown. "In September of 2010 versus 2011 there was a 2.3 per cent increase to a total number of 34 million of US uniques." The site's most recent figures showed a total of 224,000 paid digital subscribers. He added that the number of home delivery subscribers, who were encouraged to connect their account to digital subscription for free, is currently at 756,000. He added that since introducing the paywall, which he described as "leaky" in relation to offering an allowance of free articles and avoidance of the paywall via social media and search links, journalists feel a greater stake in the product. "There is more of an investment I feel in the newsroom amongst our journalists since the introduction of the paywall. They feel a greater stake in the product. People seem a little more willing to work on a piece of video, file early for the web etc. There is an overall feeling we're creating a digital product that has value. We're feeling that sensibility very strongly." He later added that the Times had considered micropayments per story, but decided against this approach. "We really wanted to establish a relationship with our audience, just as we have one with our print subscribers. We feel there's something going on between the two of us, and that our best print subs have been those who jave been with us for years." And the value of paid-for models today is "undeniable" he said, given the state of the economy in Europe and the US. "The subscriptions model we have built is much less sensitive to the rollercoaster of the economy. We knew we needed second stream of revenue. Granted it will feel the economic dips, but it will not react as wildly as advertising revenues will do. It's helping us fund our journalism."